Parliamentary under Secretary of State for Transport, Andrew Jones MP, has visited Reading Buses to launch a new contactless payment option for bus travel on the operator’s services. Reading Buses claims the new system will form the UK’s first town-wide contactless bus network outside of London, which means all residents in the borough will be served by a bus accepting the bankcards. It said it is also the first independent – non PLC – operator to go 100% contactless. The operator will be the first operator using the Ticketer system to go contactless, which also includes an integrated card reader for all card types, whether contactless bankcard, ENCTS concessionary pass or other ITSO smartcards as well as Apple and Android pay. Other contactless schemes have required separate card readers on the buses. Martijn Gilbert, Reading Buses CEO, said: “Once again we are delighted to bring a number of firsts to Reading. “We have been working hard and investing in upgraded ticketing systems, with our supplier Ticketer and payment services provider CreditCall, to get contactless launched across our entire Reading town network – something that we believe we are the first to do outside of London. 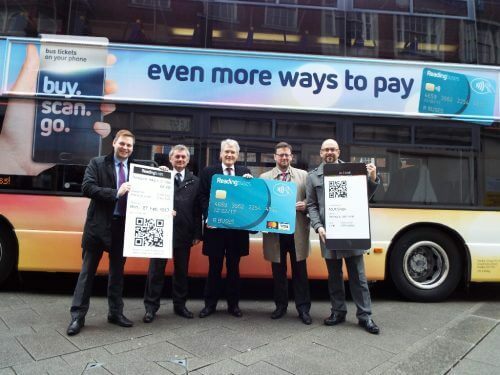 “Contactless is the final part of our new ‘three part’ digital ticketing strategy which includes the use of ‘QR’ barcodes on paper tickets – with readers installed on the buses – cutting down the amount of waiting time as people simply scan as they board rather than waving their ticket at the driver. “The Reading Buses app forms the second element which has integrated journey planning, live bus tracking and mobile tickets, all on one platform, which again uses barcode technology – and has already been hugely successful with customers. Andrew Jones MP said: “Buses make vital journeys possible every day and we are doing everything we can to improve services for passengers. “The roll-out of contactless payment technology on Reading’s bus network is great news for the many passengers every day who use them around the town. Martijn added: “Our exact fare policy, whilst important for safety and speeding up boarding times, can catch out new users. Our app will always offer the best available fares, most of which are even cheaper than paying on the bus. “But, at the same time, contactless offers a great way for new or occasional users to pay on the day without the hassle of the exact fare or needing to download the app.